After my Kente lesson I was prepared to haggle with the best of them and acquire some authentic material. 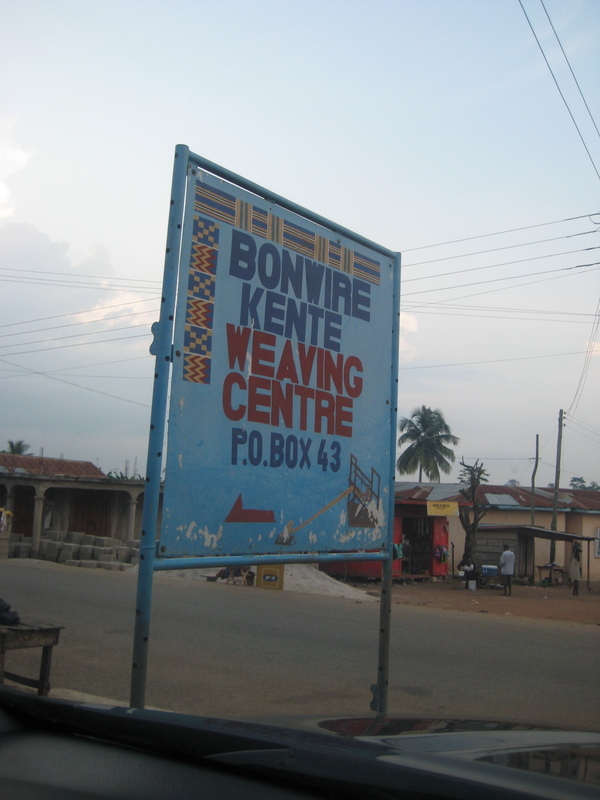 So I took a 4 hour van ride north of Accra to visit the Bonwire Weaving Center. The center is located right outside of Kumasi in the Ashanti Region which is considered the home of Ashanti culture and Kente. When I arrived at the center I was prepared to watch some weaving and buy a piece or two…what I was not prepared for was to learn so much and to do some weaving of my own. The center is made up of master weavers and apprentice weavers. Apprentice weavers learn under the masters and perform the task of single weaving (with one color) while the master weavers perform double and triple weaving techniques (weaving with multiple colors) and are able to sell their creations. I thought it was interesting that all the weavers at the center were men and when I asked about it they said that it was folklore that women couldn’t weave becasue it causes infertility. 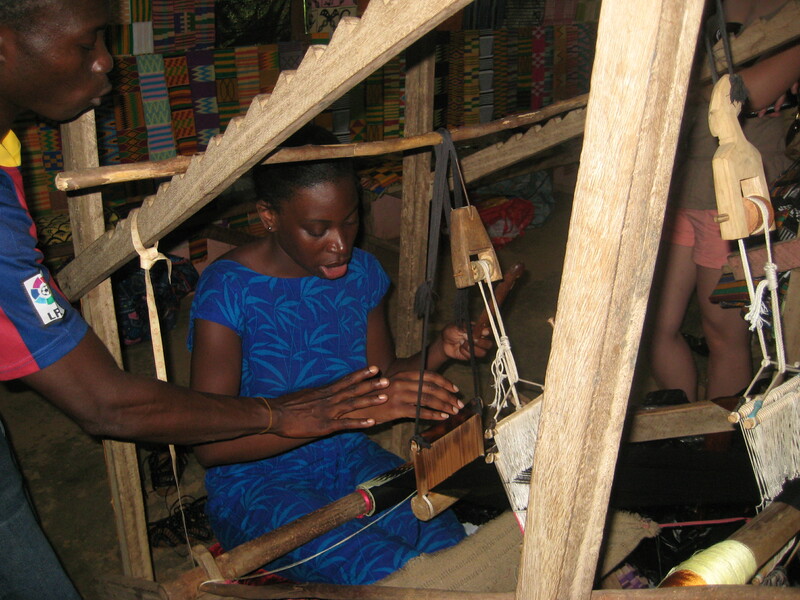 According to Kofi, one of the master weavers I met, that was a ploy to keep women doing housework (Lol). 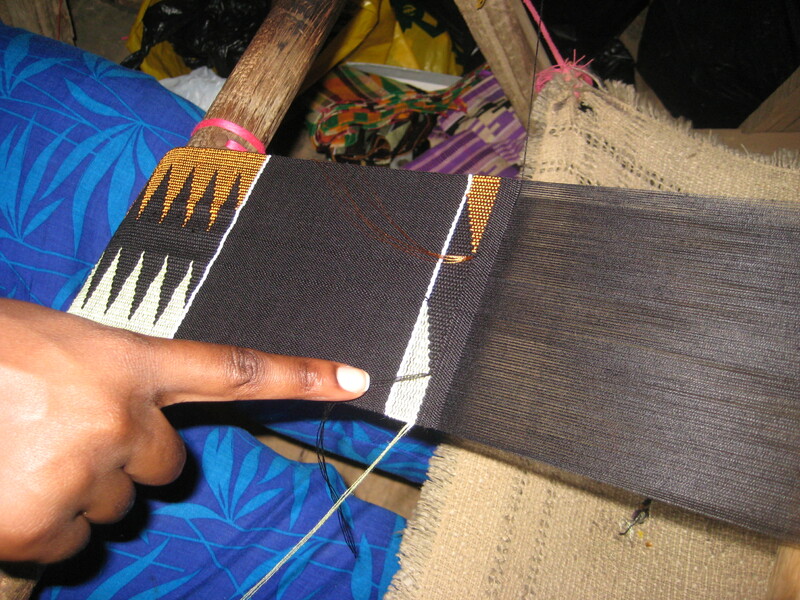 Now, more and more women are learning the Kente weaving technique. 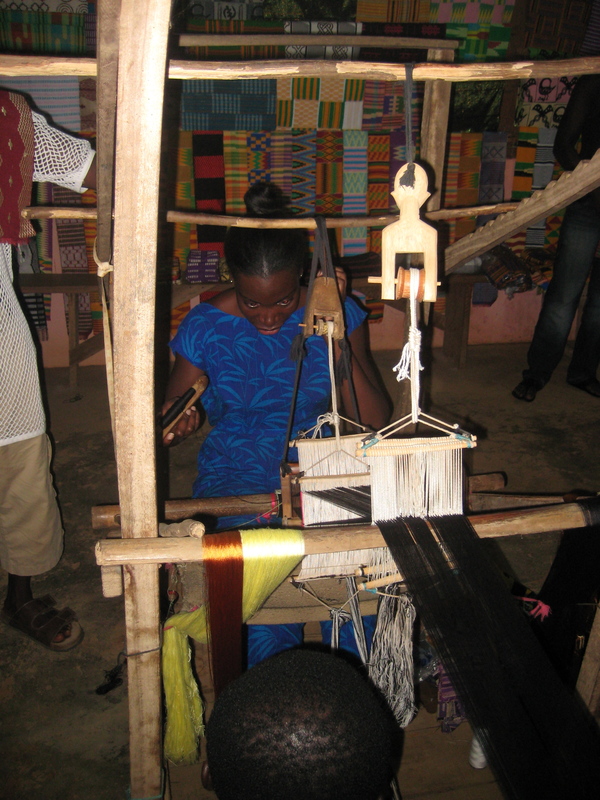 At the age of 29, Kofi had been weaving for 20 years as his father and grandfather were master weavers. 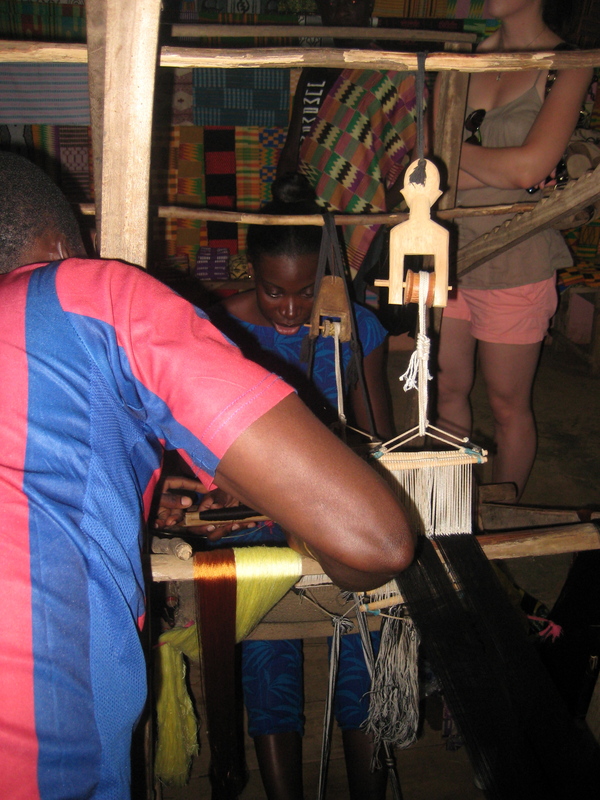 Kofi gave me my first weaving lesson. 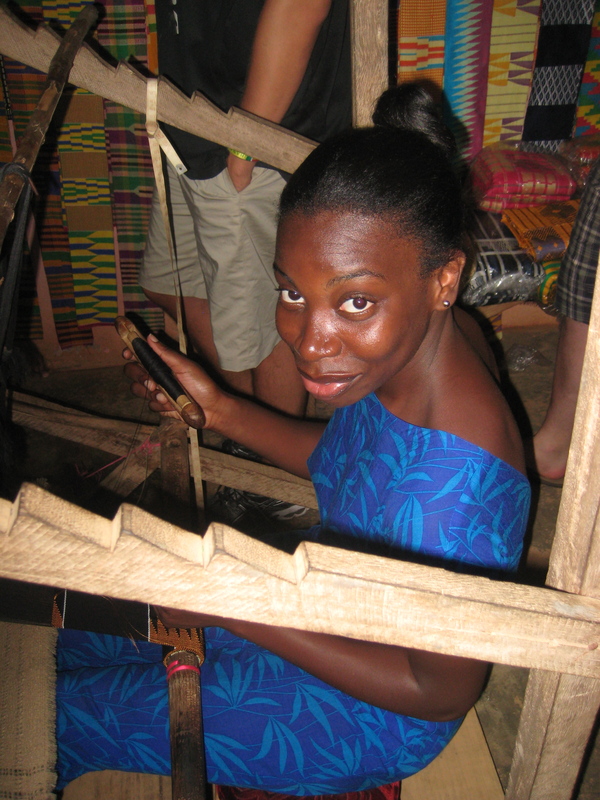 Seated at the loom to learn the single weaving technique, loops were attached to my big toes and I sat on a kid sized stool inside the wooden contraption. The loops on my toes were attached to the loom and controlled the weft, with my hands I looped a single strand through the weft, and with a comb I beat the weft. The technique sounds arduous but you should’ve seen how fast the master weavers and even apprentice weavers were doing it! There was something magical about being at Bonwire. The idea of learning a technique that has been passed down through the generations for centuries and centuries had an outstanding effect on me. And to top it off, there is nothing antiquated about this art form; to this day people are still wearing the traditional Kente prints as well as constantly innovating new ones. This experience reinforced my aesthetic as a designer with an African influence and I hope and pray that my work will be around for generations to come. Weaving! PS...Dont I look cute with my hair in a bun!